Swastikas drawn on the office of a Jewish Ivy League professor. Latinos harassed for speaking Spanish in public. Hijab-wearing women targeted in road rage incidents. Neo-Nazis bragging online about a murder. These are just some of the incidents that we and our partners have reported in our second year of Documenting Hate, a collaborative project investigating hate with more than 160 newsrooms around the country. Since we launched the project in January 2017, victims and witnesses of hate incidents have sent us more than 5,400 reports from all 50 states. We've verified nearly 1,200 reports, either via independent reporting or through corroborating news coverage. We've also collected thousands of pages of hate crime data and incident reports from hundreds of police departments across the country. Univision’s Jessica Weiss identified dozens of harassment incidents at Walmarts and other superstores. Walmarts often act as “de facto ‘town centers,’” and people of color end up getting targeted, such as being told to go back to their country or to speak English. Just this month, two men in Louisiana were arrested for allegedly yelling racial slurs at a black woman leaving a Walmart and smashing a shopping cart into her car. Reveal went through hundreds of tips in which President Donald Trump’s name was mentioned, identifying incidents all over the country ranging from harassment to assault. Reporter Will Carless spoke to 80 people who reported these tips, and he found an additional 70 cases reported in the media or confirmed with documentation. ProPublica’s Rahima Nasa reported on potentially bias-motivated crimes that weren’t prosecuted as hate crimes, including the killing of a Native American man in Washington state. Even though there were indications he was targeted and run over because of his ethnicity, prosecutors didn’t bring bias crime charges. The man convicted of the homicide received only 7 ½ years in prison. Hate crimes often fall through the cracks in our justice system, and we've only just scratched the surface of understanding why. ProPublica’s Rahima Nasa and I discovered that some police officers were marking some crimes as anti-heterosexual, including anti-LGBTQ bias crimes and offenses that weren’t even bias-related. Those crimes were then reflected erroneously in the FBI’s national hate crime data. Some of the police departments we contacted said they’d fix the errors. “Thank you for bringing it to our attention, because we never would have known,” one records officer told us. This year, we partnered with News 21, a project of the Walter Cronkite School of Journalism and Mass Communication at Arizona State University. A team of News21 reporters did a deep dive into how hate crimes are investigated and tracked, how laws are enforced, and what groups are targeted. They found that more than 2.4 million suspected bias crimes were committed between 2012 and 2016, based on an analysis of the National Crime Victimization Survey, but only 12 percent of the nation’s police departments reported any hate crimes to the FBI during this period. They also found that only about 4 percent of hate crime victims who reported to police had those crimes verified by law enforcement, and that only 100 hate crimes were prosecuted at the federal level from January 2010 to July 2018. HuffPost’s Rowaida Abdelaziz identified road rage incidents affecting Muslims and people of Arab descent. Hijab-wearing women reported hearing slurs or seeing threatening gestures from drivers, or even nearly getting driven off the road. Those interviewed said it happens so often that they don’t see a point in reporting it, especially since it’s hard to gather evidence while driving. Abdelaziz also wrote about a road rage incident recorded by a college student in Texas, which prompted an open letter from the local mayor. The Baltimore Sun’s Catherine Rentz gathered and analyzed two years worth of hate crime data from Maryland police departments, and she found that police categorized more than half of reported hate crimes as inconclusive. Law enforcement only forwarded verified reports to the FBI to include in their annual data, leaving out potential bias crimes in which a perpetrator wasn’t identified. Ten of the state’s counties reported zero hate crimes. In a two-part documentary, ProPublica’s A.C. Thompson and Frontline investigated white supremacist groups the Rise Above Movement and Atomwaffen, discovering members and associates’ involvement in violence and even murder. Reporters identified neo-Nazis who were active-duty members of the military, and one white supremacist with a government security clearance. The project had major impact. It led to indictments and arrests, a firing, a prison sentence and a change in Marine Corps policy. While overall crime is down in New York City, hate crimes are on the rise, and our partner WNYC has been reporting on many of the incidents happening around the city. We’ve received hundreds of reports about swastikas, and one report ended up going national after WNYC’s Arun Venugopal broke the story of anti-Semitic vandalism in a Columbia University professor’s office. The professor, who researches the Holocaust, said it was the second time her office had been vandalized. WNYC also reported that one of New York City’s top civil rights officials was targeted in a hate incident, but when she reported it to police, they allegedly discouraged her from making a report. Nearly 90 percent of law enforcement agencies that voluntarily submit data to the FBI claim to have no hate crimes. So Peter Aldhous of BuzzFeed News reviewed more than 2,400 incident reports of assaults from 10 police departments that reported zero hate crimes in 2016. In the process, he identified assaults that should have been classified as potential bias crimes but weren’t. 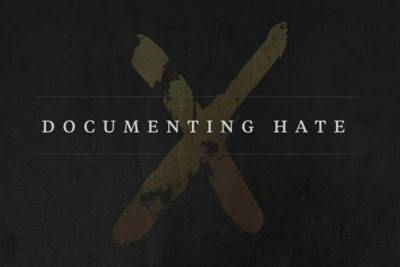 We’re still figuring out where the Documenting Hate project goes from here, but we’re proud of the work it has produced, both by our newsroom and by our partners. It’s a topic that, unfortunately, retains its relevance and its urgency. Have you been a victim or witness of a hate incident? Please tell us your story.